Yesterday I posted three videos that I liked despite the fact that they weren’t exactly in our wheelhouse or down the middle of the NCS fairway or [insert other sports cliches]. For those of you who might have wanted something mo metal, I have the following three videos that appeared since I wrote that earlier post. 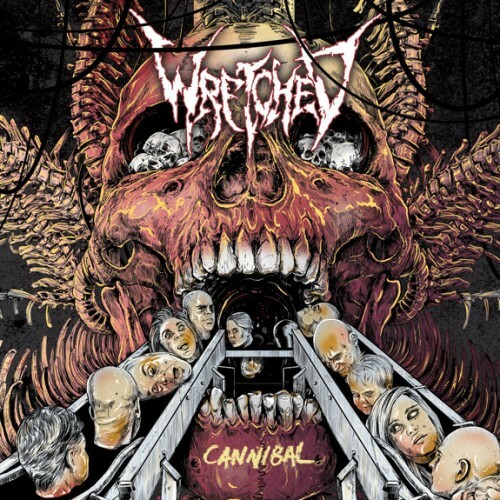 The first video is for the song “Wetiko” from the album Cannibal by North Carolina’s Wretched. DGR praised the album in his review for us earlier in June. The well-made video (directed by Eric Richter) focuses on the band performing (as well as some self-satisfied assholes behind a pulpit). It effectively combines slo-mo footage with seizure-inducing bursts of speed. Also, frontman Adam Cody looks really, really pissed-off. Also, lots of skulls. My history with Wretched is a spotty one at best. I discovered The Exodus Of Autonomy way too late for my own good, on the insistence of a fellow writer at a previous website, and really enjoyed it — but it was one of those situations where I felt I had really missed the zeitgeist on the band. Thus, when Beyond The Gate hit, that was my legit starting point with Wretched and I found a group who had gone really far into the melodeath spectrum of things, which I still feel was so odd given Victory Records’ slate of artists at the time. 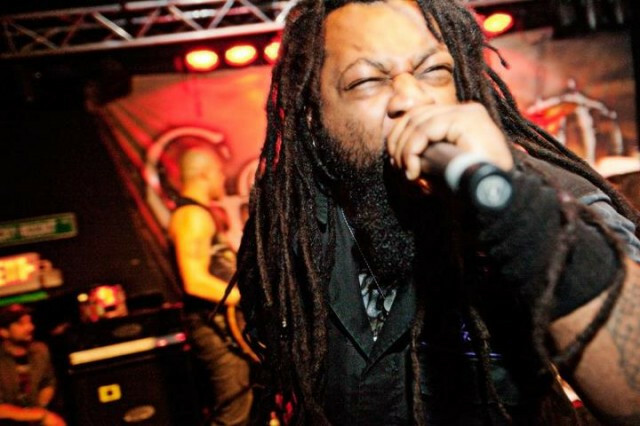 In fact, they still feel like they were then one of the more intense groups on Victory’s roster, not prone to overindulgence on breakdowns and instead an intensely guitar-heavy, straightforward band who bounced between the various spectra of death metal at the drop of a hat. They were a band who were hard to pin down, moving between a variety of genres and landing them with tags like “progressive death core”, “tech-death”, “thrash”, and everything else that could have “death” suffixed or prefixed to it. I know many of the people who will be reading this interview will already be very familiar with you, but for the less enlightened among us out there can we get just a quick introduction as to who you are, what you play, and how long you’ve been with Wretched? Hi Dave! Sure thing. I’m Steven Funderburk, I play Guitar, and I am one of the original members of Wretched. We started out in 2005, so almost 9 years now. Cannibal actually marks the first one-word album title for you guys — after usually being in the three- to four-word range. Why did you guys settle on something as simple and straightforward as Cannibal? Indeed! Well, from the get go, we wanted to write a straightforward heavy record from start to finish. We had nothing but heavy grooving in mind. It just made sense to have a title that not only fit with the lyrical content, but with the musical aspect of the record. We wanted to get straight to the point with the title, artwork, and everything behind this record. No frills, just straight-up in-your-face metal. 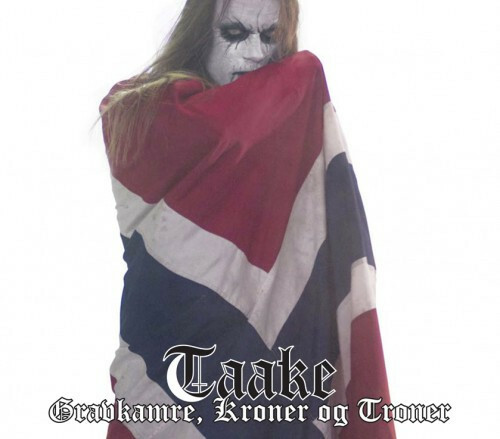 How’d you come around to the artwork for this album? It’s very different from the previous few. Over the last 24 hours I discovered (thanks in large part to tips from NCS friends) quite a lot of new music and news that I’d like to recommend to you — so much that I’m dividing the discoveries into two posts today, this being the first. It will be released in North America by Nuclear Blast on July 8 (yet another birthday present for me!) and by Agonia Records in Europe on July 4. 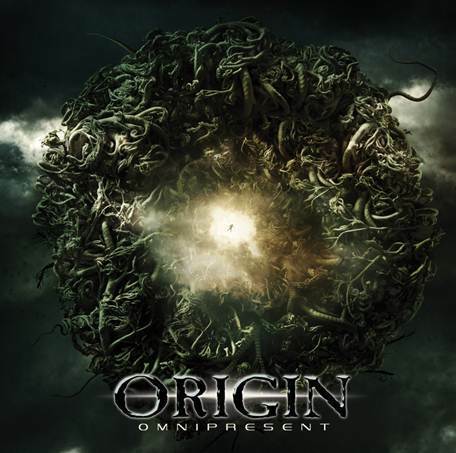 The cover art, which is visible above, is by Colin Marks (Nevermore, Kataklysm, Exodus), who also created the cover for the band’s Entity album. 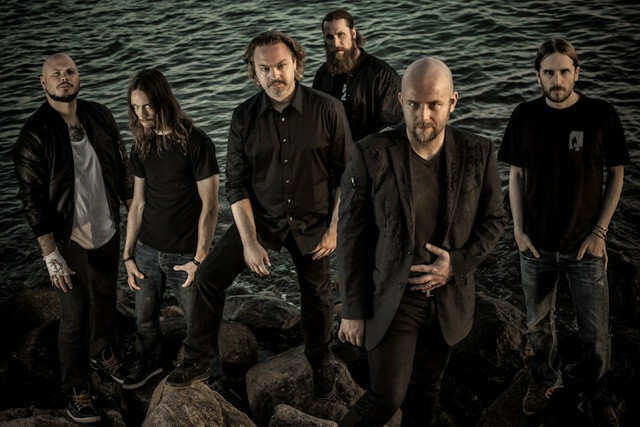 Sweden’s Soilwork have been working with producer Jens Bogren on a new double-CD album, The Living Infinite, which will be released sometime next year by Nuclear Blast. Today, they announced the first North American tour in support of the album — and it’s a mammoth one. It will begin on March 12, 2013, in West Springfield, Virginia, and finish on May 7 in Worcester, Massachusetts. 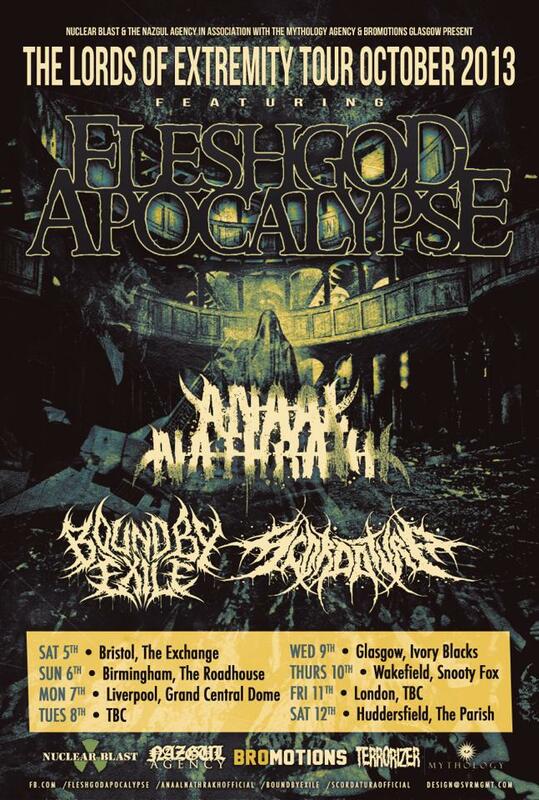 I’m sure I’ll see this tour, especially because it’s coming to a relatively compact venue in Seattle, but also because I still have a warm spot in my heart for Soilwork despite a musical trajectory over time that’s been less than completely satisfactory, given my tastes. With a new double-CD worth of new music to promote, I suspect there won’t be much room for the really good, hard, older stuff, but we’ll see. 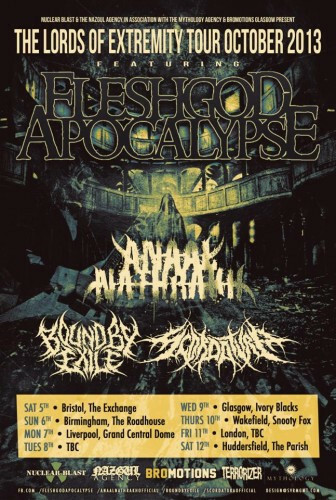 Also, Jeff Loomis is along for this ride, and I’d see this show even if he were the only name on the bill. There’s something to be said for the old grind of, “Third time’s a charm,” when it comes to Wretched. They’re a band that have been consistently good, but for some reason just never quite clicked with me. Exodus Of Autonomy was an excellent disc that stood in the bridge between metalcore and melodeath, leaning heavily as hell on the melodeath side, and the follow-up, Beyond The Gate, took the group even further into territory that probably made them unrecognizable to the breakdown crowd. Personally, I thought Beyond The Gate retained a lot of Wretched signature style, including their tendency to write some very interesting instrumentals in order to break up the flow of the album. Three videos from yesterday, packaged together for your viewing pleasure. The first is the official video from God Forbid and Victory Records for the song “Where We Come From” off the band’s sixth album, Equilibrium, which is going to drop on March 26. This is the second track released from the album so far, the first being “Don’t Tell Me What To Dream”, which we featured in an earlier post (here). Both songs are strong. Although I thought the first one incorporated some “modernizing” elements, this new one sounds more like what I expected from these metalcore heavyweights. It’s immediately infectious and of course it brings the groove. It’s a fun video, too, transitioning from day-job clips to a live performance at a joint called Dingbatz on February 24. 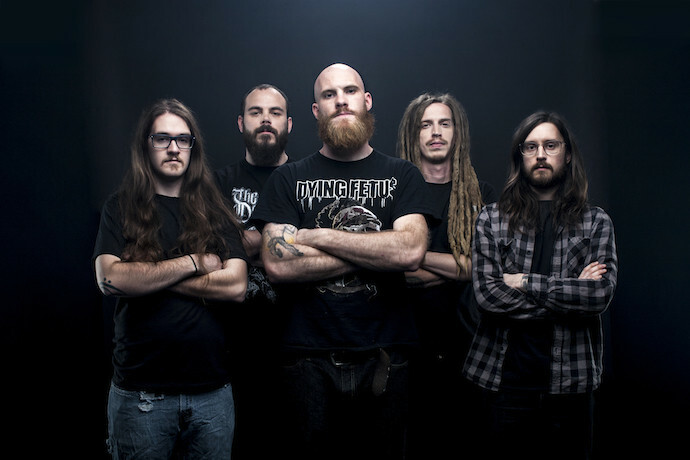 God Forbid’s North Carolina label mates Wretched also premiered a new video yesterday. Victory seems to be staging the ramp-up to both bands’ albums in tandem (Wretched’s Son of Perdition is due for release on March 27). 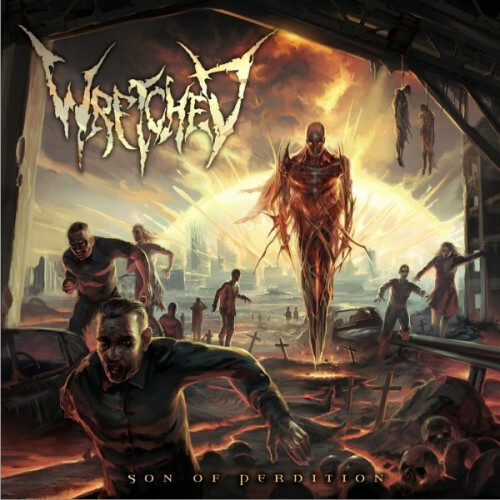 We included the first track from Wretched’s album in that same previous post that featured “Where We Come From”, because they premiered on the same day, too. The new song is called “Dilated Disappointment”, and it’s a heavy metal blizzard. In fact, it appears to have ionized the atmosphere where the video was shot, leading to an electric storm that matches the conflagration of the music. The third video is one I discovered thanks to an e-mail tip from Ben C. (Church of the Riff). It’s a visually arresting CGI animated short called Ruin. It depicts airborne mechanized hunters chasing a human (who doesn’t seem to be entirely human) through a post-apocalyptic city. Fortunately, the prey has a Yamaha MT-01 in damned good running order, so he has a fighting chance. I’m not a gamer, so the level of visual detail and realism achieved in the video may be old hat, but it sure wowed me. It was created by Wes Ball and Oddball Animation. Once upon a time, when metalcore was a new thing, I ate it up, all I could get and as much as I could hold. 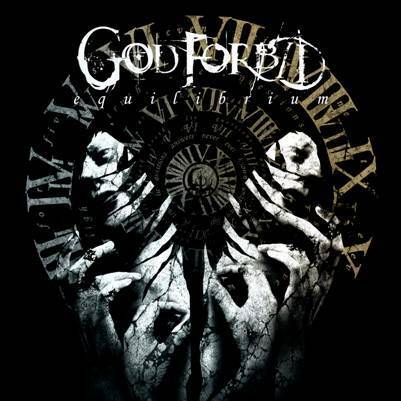 And one of my favorite bands was God Forbid. My listening tastes have moved off in different directions, but I’ve still got a soft spot for this band, and I’m getting curious about what’s happened to their music. We’re all about to find out, because their sixth album, Equilibrium, is going to drop on March 26 via Victory Records. The line-up hasn’t changed much since the early days — Dallas Coyle is gone and Matt Wicklund is in — but the world of music has changed a lot since the days of Determination, and God Forbid have done their share of changing along the way, too, with a more dominant thrash attack, jacked up by the head-spinning guitar solo’s of Doc Coyle and even the incorporation of progressive influences. But three years have passed since Earthblood, and I’m wondering where we’ll find God Forbid now.